So, You Want to Keep Honey Bees? Credit: I stole the title from a book that has the siren song of a title, "So, You Want to Live in Hawaii?" Beekeeping is fun and rewarding. People from all walks of life keep honey bees. And so can you! Educational: Insects intrigue me and I want my kids to learn something about biology and nature and give them a unique experience. I already garden, and have goats & chickens... that just leaves bees! Cool-ical: Bees are just cool! There are loads of reasons to keep honey bees. But there are some things you have to consider. Honey bees are an animal in your care. You can't just set up a hive and forget about it. Honey bees are relatively low maintenance (compared to other farm animals), but if they are under your care... they need to be cared for. Are you ready to be stung eventually? Not meaning to be alarmist nor dissuade, but you will be stung. Eventually. Working carefully around the honey bees means that stings are fairly rare, but they do happen. If you work with a mentor, they can really help you get over this fear. Remember, like many fears, it is mainly psychological. Also remember, in the beginning, you will probably be armored from head to toe with a jacket, veil and gloves... nearly impossible to get stung. If you are going to adopt a hive or two of honey bees, you have to accept this basic premise. If you think you are allergic to honey bee stings, you probably aren't. Bee sting allergies are actually fairly rare, but many MANY people walk around with epipens due to an over-cautious allergist. Most of those people are not in danger. If you are one of those people, ask your allergist if you are really truly in danger, and if so, are you in danger with honey bees (you can be allergic to yellow jackets but not honey bees for example). A sting can cause significant swelling (your whole arm for example) until your body adapts.This is a normal reaction believe it or not. Many many people think this means they are allergic to honey bee stings. They aren't. Honey bees are amazing creatures; amazing creatures that will steal your heart and earn your respect. ...and start talking to other beekeepers about your intentions. Sign up for a beginner beekeeping class. If one is not being offered yet. Check back with all your local bee clubs every month or so until you get one on your calendar. They often fill up fast. There are a lot of good books out there. For the beginner, there are a few standouts. We particularly like First Lessons in Beekeeping. We sell that book on our website and use it for all of our classes. But we also like Beekeeping for Dummies, The Backyard Beekeeper, and The Beekeepers Handbook. There are a bunch more great beginning beekeeper books out there and they are all adequate, but those four stand out, in our opinion. Order bees. Two hives worth. You can't do this early enough. You may be waiting 6 or 7 months for bees depending on time of year. For example, spring bees sell out fast! If you can get them early (late-April, early May... regionally dependent) we prefer packages over nucs. Any other time of year, a nucleus hive is ideal. In our region, honey bees are available from May until end of August. Order equipment enough for two hives. Talk to your fellow beekeepers where they get their equipment. There may be a local supplier. Or just google beekeeping equipment. There is a lot to choose from which can be confusing. Your fellow beekeepers can help you here. Ask them what equipment is just a waste of money. We'll recommend some equipment below. If you have a little extra room in your budget, we'd recommend one more hive's worth of equipment than you have bees. Build a hive stand and find a location for your bees. Get your equipment together, painted and ready well before you get the bees. You do not want to be scrambling when those bees arrive. Make sure your schedule is clear for honey bee pickup day! (or dropoff day if coming through the mail) - Your honey bees deserve prompt attention when they arrive. If your bees are arriving by mail, you may get a call from the post office to come pick up your bees RIGHT NOW. You may be able to ask your mentor to be ready to help you that day (or evening). You will get your bees. Take them to (or close to) their hive and then let them rest in a cool place before you "install" them into their new home. So you have time, no more than a day or two. You learn this via a book, video, mentor, class, or ... even where you pick up your honey bees. When The Carolina Bee Company sells a package of bees or a nuc, we give each customer a crash course on installation - but nothing beats a mentor. Installation is a process that takes about a week. One or two days for "installation", another couple days for verification of success, and a week to make sure it has "taken" and that the bees have settled in entirely. The first few months are all about learning and helping those bees establish a hive. You need to feed copiously (sugar water) until those bees have built a bunch of comb and that queen is laying eggs and growing the hive. There is a rhythm to beekeeping, like all agricultural activities, and the objective is to get that hive established and able to survive the normal rhythms of the year and through that first critical winter. Really focus on learning about that rhythm of beekeeping, the beekeeping year. What's in bloom, the expansion and contraction of the hive. Mites, diseases, pests. What's in bloom and when honey is coming in and when there is a dearth. Swarm season. All that! Mentors! Learn about the biology and behavior of honey bees. Honey bees are fascinating creatures with a complicated social structure and communication systems. The more you know, the more you can understand why the bees do the things they do. This is a must. That first year is a learning year. You may or may not be able to extract honey that first year. The focus is helping those beehives survive the first year and to get through the first winter. Try to only inspect the hives periodically and not every day. Enjoy their comings and goings and only open the hives intermittently. Remember that every time you open the hive you are disrupting their normal functions. Honey bees are forgiving, but they need their beekeeper down time as well. Give honey away to your close friends, family, and neighbors. The fruits of your labors, and the labors of your honey bees, is something special. That first honey is extra extra special. A little honey though goes a long way towards ensuring your neighbors appreciate what you are doing. Langstroth hive. And a big one! This hive from early 2013 did fantastically! We recommend 8 or 10 frame Langstroth-style beekeeping equipment. For each hive, two deeps and 3 shallows is probably a good start. But there are a lot of options out there. For beginners we recommend starting with the same equipment your local beekeepers are using. This may mean "all mediums" or "all 8 frame equipment"... etc. Other considerations include age and strength. Beekeeping equipment can be heavy to move around. If you have a partner or spouse helping with the bees the style of equipment may be less of a factor, but "deeps" can be very heavy to manipulate. For honey supers, we use medium sized equipment that can reach 40 or 60 lbs when full of honey. "Shallows" may be a better choice. 8-frame equipment versus 10-frame equipment also reduces this burden. Work with your mentor on these choices. If we did it all over again, we'd probably settle on 8-frame equipment with a standard hive being 2 deeps and up to a typical 3 shallow supers for honey. It's just easier to manipulate. That being said, 10-frame equipment is most typical in the beekeeping world. Top-bar hives are a whole different style of equipment. The two real advantages of top-bar hives are that they are (1) worked from left to right and not top-to-bottom. What that means is that you are not lifting heavy equipment and that everything is at the same level. It also means you are less disruptive to the normal lifecycle of the honey bee. (2) Top-bar hives can be more economical if you build your own equipment. There are plans out there that make top-bar hives very cheap to build if you are handy with woodworking equipment. The disadvantages are that... (1) top-bars are not standardized at all. Langstroth-style hives are standardized in the beekeeping industry. A deep box is a deep is a deep no matter the manufacturer. Top-bar hives have no such standardization. 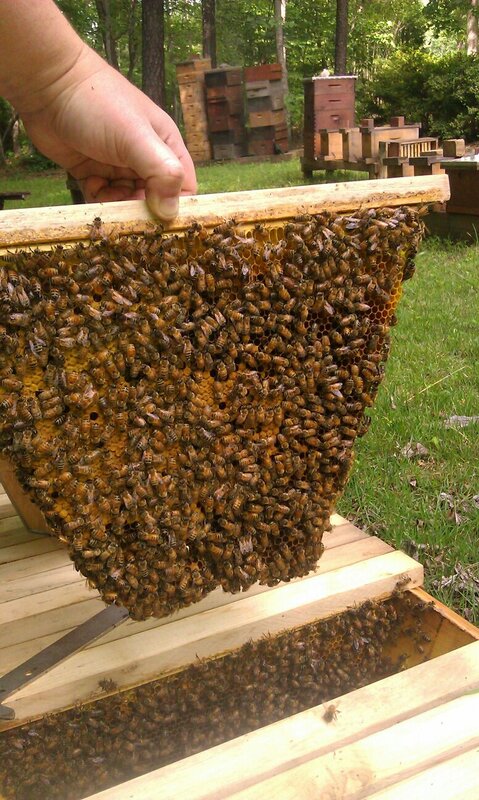 (2) Top-bar hives are harder to expand per hive. I.e., with a Langstroth-style hive, the hive can expand indefinitely bigger. 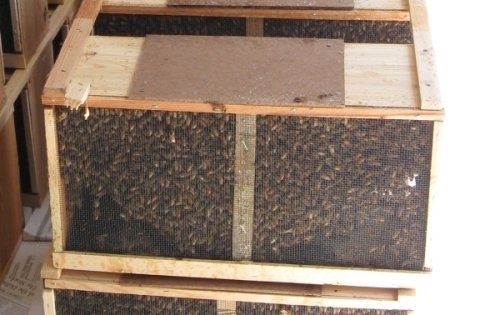 A top-bar hive is a fixed size. There are work-arounds for this, but they kind of defeat the purpose of a top-bar hive. This is not a huge problem... unless you regularly have honey bees that go gang-busters and expand like crazy (lucky you!). (3) Honey extraction is more problematic. Essentially you will be cutting out comb and crushing it to get the honey and,, in the process, you are removing a lot of energy-expensive wax. For a backyard operation, this means less honey for you and more work for the honey bees. That may be important to you ... or not. Also note, if you choose top-bar hives, nucs are not really the best option for starting. You will want to start with packages of bees. One can get lost in all the breeds of honey bees available to you. Italian (European) honey bees. Carniolan, Russian, Caucasian, Buckfast, SMR, Minnesota Hygienic, etc. etc. Our #1 recommendation is to get similar honey bees to what folks are using in your area. Maybe even source your first honey bees from a local breeder. We personally breed our own. They are a mix of Italian/Carniolan crosses with a smattering of everything else in between. I.e., to some degree they are mutts. We breed for survivability for our area of the country. Up north, Carniolans and Russian bees probably do better. Down south, Italians. But that doesn't mean you can't use Carniolans down south and Italians up north. It can get complicated. Start with bees from your area... if we had to sum it up, that would be our recommendation. Also, ask about the hygienic nature of the honey bees you are buying. That is a trait that breeders emphasize that boosts the chances of the bees living to the next year... for all varieties. One major caveat, we no longer recommend Buckfast bees or honey bees from Africanized infested areas of the country (namely Texas and Arizona). There are exceptions to that rule, but it would give me pause if the breeder was from those areas (unless you live in Texas and Arizona) or was selling that variety of honey bee. When in doubt, don't. Honey bees follow a pattern of seasons that is a bit different than what one may think of when they think: Spring, Summer, Fall, Winter. Honey bees' lives revolve around food availabilitity (nectar and pollen) and sunlight and warmth. In this next section, we'll walk you through a year in beekeeping. The dates may be a bit different dependent upon what part of the world you live in, but the activities are largely the same. 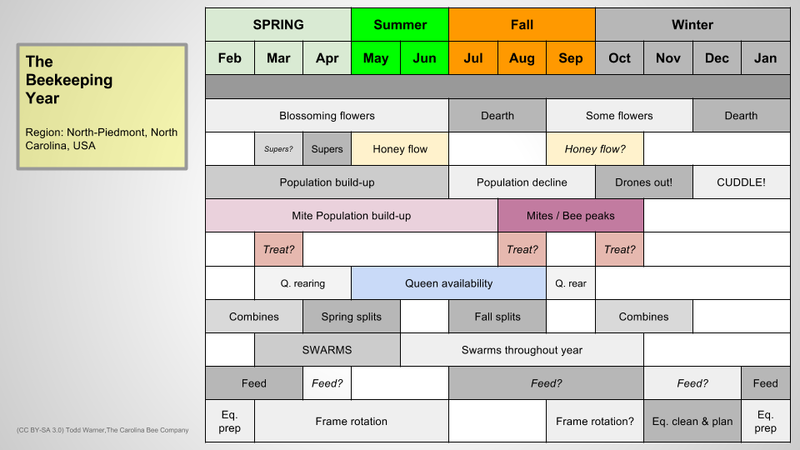 The Beekeeping Year for the Northern Piedmont of North Carolina, United States. (CC BY-SA) The Carolina Bee Company.